Jun. Prof. Dr. Christopher Robeller leads the Digital Timber Construction group DTC at TU Kaiserslautern. 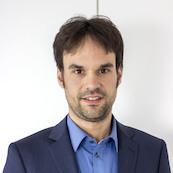 He has previously worked as a postdoctoral researcher at the Swiss National Centre of Competence in Research Digital Fabrication NCCR dfab at ETH Zurich, as a doctoral assistant at the Timber Construction Laboratory IBOIS at EPFL Lausanne, and as a research associate at the Institute of Computational Design ICD, at the University of Stuttgart. Christopher holds a Doctor of Sciences from the Swiss Federal Institute of Technology EPFL, and a Professional Diploma in Architecture with Distinction from London Metropolitan University. His research of innovative timber structures, design for assembly and digital fabrication is widely published in scientific journals, books, conferences and exhibitions, and received awards such as the Advances in Architectural Geometry conference in 2014. The research has been implemented in experimental structures including the ICD/itke pavilion 2010, the 2013 IBOIS curved folded wood pavilion and the 2018 X-fix Timberdome pavilion, as well as buildings such as the timber folded plate structure for the 2017 Vidy Theater in Lausanne and the 2018 Multihalle Manternach.